Open the project folder in Finder, and you’ll see that CocoaPods created a new Weather App.xcworkspace file and a Pods folder in which to store all the project’s dependencies. From now on we will be using this workspace and not our Weather App.xcodeproj. Go ahead and close the project file and open the workspace. Make sure to press Later if you’re asked to convert to current Swift syntax. Make sure everything is working by building your project (⌘B). If it fails, double-check that you opened the xcworkspace and not the xcodeproj. We want to use a Navigation Bar style so we can add a refresh button in the top bar. 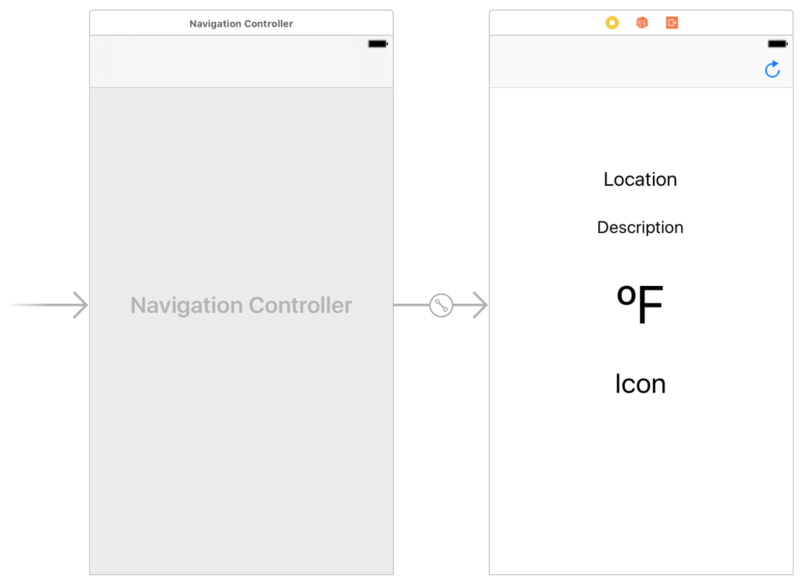 We want to embed our current View Controller in a Navigation Controller. Select the View Controller by clicking the white bar with the three icons. Then click Editor-> Embed in -> Navigation Controller. You can enter the degrees sign with Option-K. If you don’t know how to work with Autolayout constraints, you can just move on. If you want to come back to it later, our Calculator Tutorial is a good resource to learn more about Autolayout. 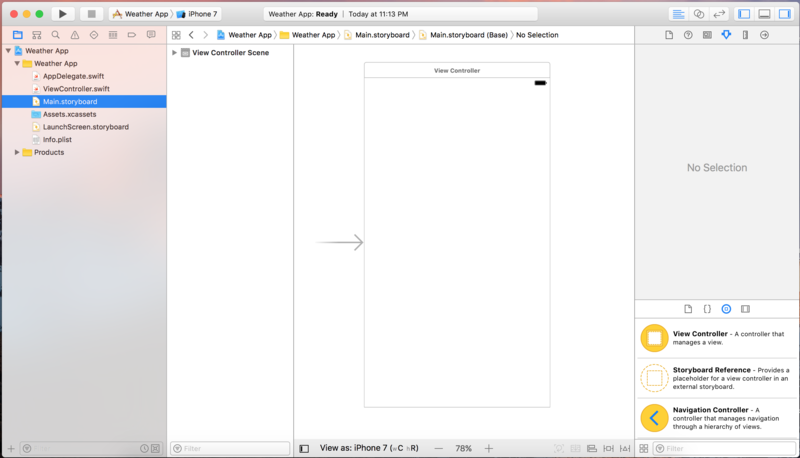 After your WeatherViewController.swift file is done, make sure your view controller is connected to this new file. To do this, go back to the storyboard and select the View Controller. 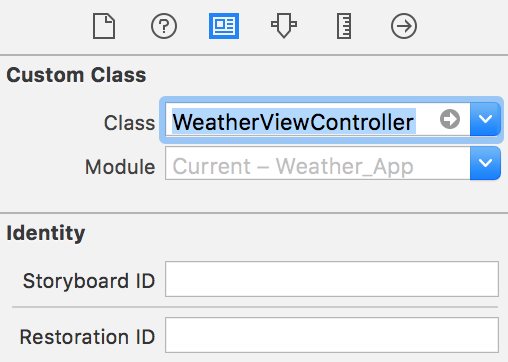 On the Inspector pane to the right, select the Identity Inspector menu, and make sure the View Controller’s class is WeatherViewController. @IBOutlet weak var weatherLocation: UILabel! @IBOutlet weak var weatherDescription: UILabel! @IBOutlet weak var temperature: UILabel! @IBOutlet weak var weatherIcon: UILabel! Awesome! Now we have added connections for both the labels and the bar button item to Swift code. In the next parts, we will be using the Dark Sky API to obtain weather data and show it in our newly created UI!